This week, I shifted my focus to my other big project that I'll debut at this year's National Stationery Show. 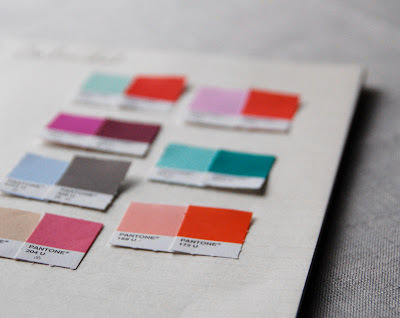 And once again, I have the Pantone chips strewn across my desk as I work through color selections. I can't seem to get away from the sorbet/summery hues, and I think it might have something to do with our trip to Florida next week - or the fact that it's felt like Florida here in NY for the past few days. I've been gathering lighter & brighter clothing for the trip and am drawn to all things bright, floral and striped. And I think my yearning for all-things-summery is carrying over into my projects. Luckily, with this project in particular, I think it'll work quite well. I'm excited to share it with you all early next month, just before the show. Have a great weekend and a great next week! Please tell Lauren that we are all praying for her and her family.